Fashionable Folk and their trends! 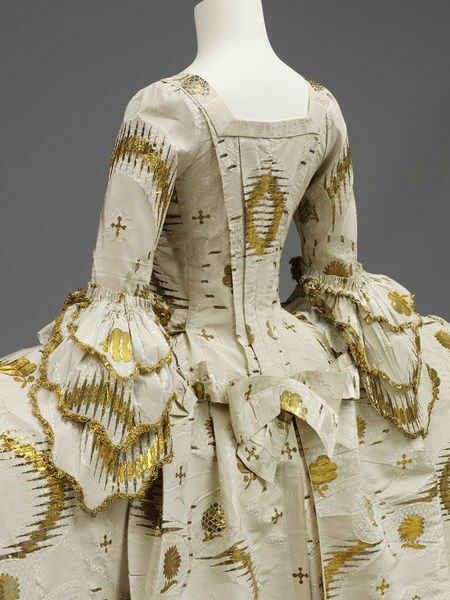 This amazing construct is Sofia Magdalena‘s wedding gown (a robe de cour, which is a super-fancy court gown) worn at the wedding in the Royal Chapel November 4, 1766. 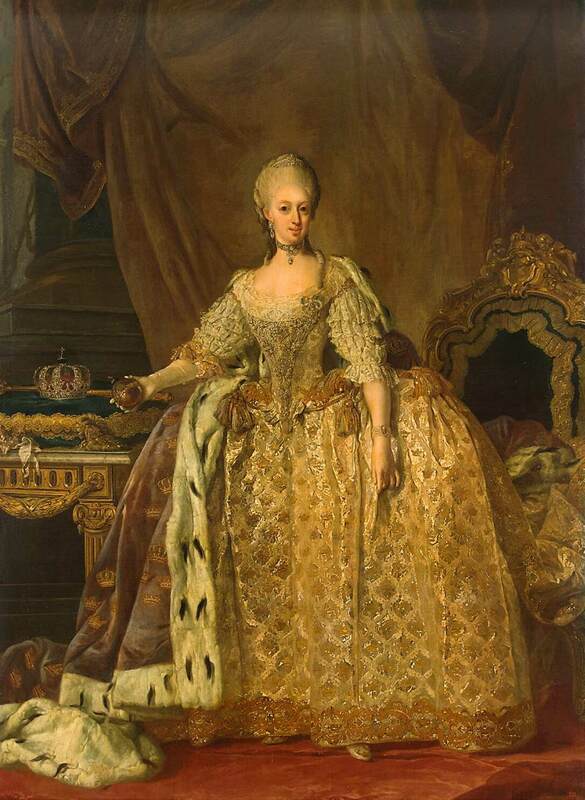 Sofia Magdalena was the queen of Sweden February 1771 – March 1792. She had fabulous, rich taste in clothing! Not only did she wear this magnificent wedding gown, her portraits portray her as ever flamboyant and trendy. Sofia was actually a very private person and found constant court visits and public appearances wearisome. She was introverted and polite, preferring to stay at home out of the limelight. Imagine her horror when it was rumored that her firstborn Heir Apparent was supposedly illegitimate! 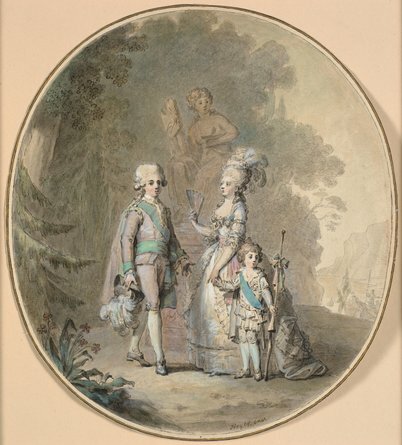 Neither she nor her husband King Gustav II were sexually experienced or even very interested in any activity of that sort (It took nine years for them to consummate their marriage), so they employed the much more experienced Count Adolf Fredrik Munck af Fulkila to be a “bedchamber coach” of sorts. The scandal rocked the Swedish court (and produced some very crude and risque caricatures in the process). It did not help that the royal family paid Munck handsomely and promoted him, enforcing the rumor that Munck had been hired to directly impregnate the queen. Even the King’s mother believed the rumor and Sofia was so offended that she refused to talk to her mother-in-law ever again. Sofia’s trials didn’t end there. Her husband was murdered in 1792. After his death, Sofia withdrew from society and made a few small waves once again by only wearing mourning clothes for formal visits and appearances, but not wearing mourning clothes in private. Having never really desired public attention, Sofia isolated herself from the court, focusing her energy on family and charity. She died in August of 1813 at the age of 67. Being queen is never a simple task, but judging by the lives of Sofia Magdalena and her contemporary, Marie Antoinette, being a Queen Consort in the mid-18th century was a grueling, tragic task. The clothes may be beautiful, but with distant husbands, judgmental relatives, and rumor mills, it hardly seems worth it! I consider myself a costumer collector, but my collection is nowhere near as awe-inspiring as the collection of Tasha Tudor, an illustrator and children’s book writer. Her collection spanned all of the 19th century, especially the rare and wonderful fashions between 1830 and 1850. She collected not just gowns, but shoes, hats, undergarments, men’s clothes, children’s dresses, and more! The collection was put up for auction by the Charles A. Whitaker Auction Company in 2007, a year before the beloved author died. It’s truly a beautiful archive of all fashion types during the 1800s! These are just a tiny sample of all the wonderful fashions! To view the entire 400+ piece auction archive, click here or on the picture below. 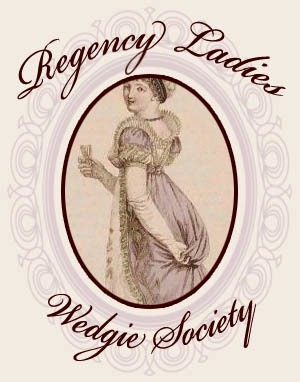 There are beautiful changeable silk gowns, mauveine dresses, velvet Spencer jackets, and lovely examples of lady’s unmentionables to study! Thank you, Ms. Tudor, for your wonderful collections, work, and life. You have touched many lives with your books and your spirit lives on through them. Thank you. 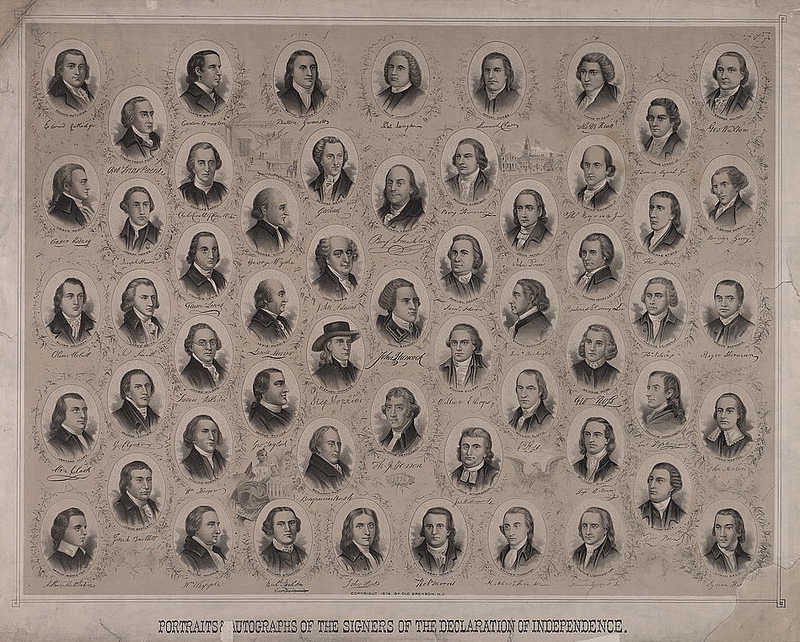 Most of us know that Thomas Jefferson, Benjamin Franklin, and John Hancock left their mark on the Declaration of Independence, but what about the other 53 men who scribbled their names onto history? All of these men risked their lives for the independence of America. Some suffered for it; others were blessed to see their dream of a united, democratic republic come to fruition. Learn more about these men and their lives here (for short tidbits) and here (for biographies). Whether you consider 1776 the United States of America’s birthday or not, everyone in the nation comes together on July 4th to celebrate freedom! 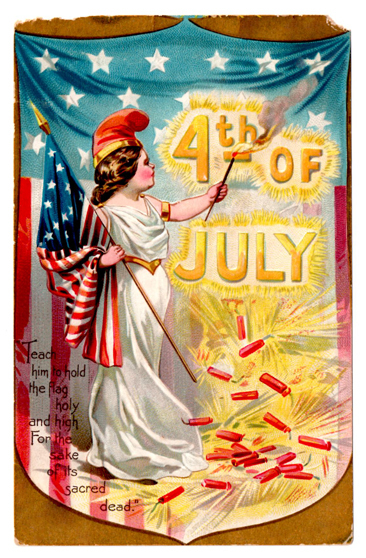 Happy Birthday, US of A! I’m a sorta-redhead. My hair can’t decide whether it wants to be mousy, dishwater blonde or a snappy strawberry (which makes picking out outfits a drag since some colors look good with redheads, but not with blondes and vice versa). My hair’s indecision began when I was just a baby; I have a natural pink mohawk in most of my baby photos thanks to my light strawberry blonde curls piling on top of my ivory skin. My hair turned blonde and straight when I was two, then switched back to curly auburn when I was 16. By junior prom, I was sick of my hair flip-flopping from red-to-blonde-to-brown-to-all-three. L’Oreal Excellence Creme in it’s cute, pink box promised to even out my hair color in just 30 minutes and a shower. Who was I to refuse? Dousing my unruly hair with dye disguised my hair’s spotty nature, and it’s pretty historically accurate at that! Natural redheads are mutants (with recessive variant genes). Our superpowers are sticking out in a crowd and looking awesome. Many have scorned our powers by flogging us with insults (“Gingers have no souls!”) while others have venerated our hair’s glory with paintings, festivals, films, and flattery. If imitation is the highest form of flattery, redheads are the most flattered of all hair colors: Sixty percent of women who dye their hair do so at home. Of them, twenty six percent choose to go blonde, twenty seven percent go brunette, and over thirty percent choose to become redheads! Feel the power! Jean Grey: Exploring both sides of the redhead stereotype since 1963. The see-saw between scorn and veneration has been going on since redheads were first documented in Greek writing. Boudica, the warrior queen, is said to have had long red hair that–in addition to her stature–was a terrifying, powerful sight on the battlefield. The idea that redheads have fiery tempers stems not only from the flame coloring, but also from the politically powerful redheaded women like Boudica who were just as powerful and intelligent as men (if not more). This was naturally unnerving to a society in which women were expected to be subservient. Throughout history– even through the 1950s– redheaded ladies have been breaking rules and changing social norms! Perhaps the most famous redhead in history is England’s Queen Elizabeth I. Born to Hanry VIII’s most notorious wife, Anne Boleyn, Elizabeth inherited her father’s golden-red hair. When she took the throne in 1558 at the age of 25, she brought wit and unprecedented political prowess with her. She refused to marry and actively participated in the jurisdiction of her country. Though she was affectionately called the “virgin Queen,” she is reported to have taken many lovers and favorites throughout her long reign. 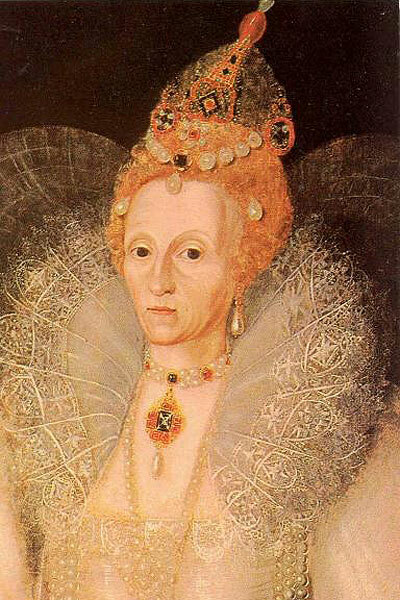 Beloved by her subjects and lauded for her role in England’s victory over the Spanish Armada, Queen Lizzie changed red hair from a fashion faux pas (blonde was the previous preferred color) into England’s must-have shade. For coloring the hair so that it is golden. 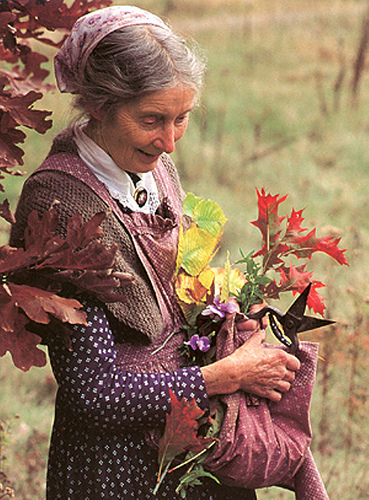 Take the exterior shell of a walnut and the bark of the tree itself, and cook them in water, and with this water mix alum and oak apples, and with these mixed things you will smear the head (having first washed it) placing upon the hair leaves and tying them with strings for two days; you will be able to color [the hair]. And comb the head so that whatever adheres to the hair as excess comes off. Then place a coloring which is made from oriental crocus, dragon’s blood, and henna (whose larger part has been mixed with a decoction of brazilwood ) and thus let the woman remain for three days, and on the fourth day let her be washed with hot water, and never will [this coloring ] be removed easily. I’ve highlighted the word henna because this particular plant was the primary source of red hair colorant since the age of the Pharaohs! Henna is mostly famous as a skin pigment, but this semi-arid shrub also works as a semi-permanent hair dye and was the most popular way to get red hair until synthetic dyes were invented in the late 1800s. Queen Elizabeth herself dyed her hair as she aged and her hair became white. The auburn-red of her earlier portraits fades into a light pinkish-orange since henna is a naturally orange dye that only reddens the base color. If the base color is a brown, it tints it red. If the hair is blonde, henna creates a golden strawberry. By the end of her reign, Queen Elizabeth’s hair was fine and white, so the true color of the henna is revealed in her portraits. 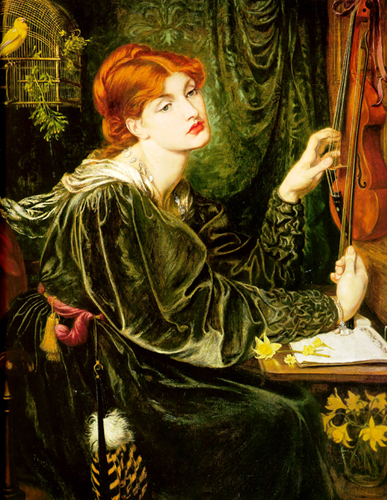 Red hair gained popularity again in the mid-1800s, culminating with the Pre-Raphealites and their beautiful models like Fanny Cornforth, Alexa Wilding, and Elizabeth Siddal: ladies with deep burgundy and ginger-flamed hair. The Pre-Raphealite Brotherhood, a group of artists, began in 1848 and lasted for an all-to-brief decade. Their influence on artistic style and fashion was much longer lived. 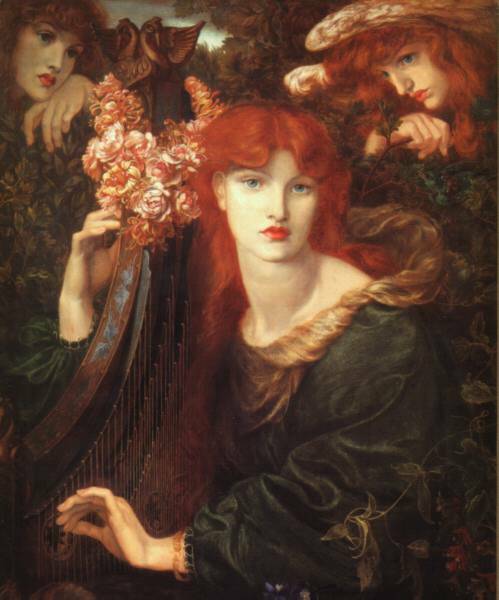 The mauves, greens, and blues of dreamy pre-raphealite paintings were perfectly suited to complement cascading red hair. Paired with swaths of roses and loosely draped gowns, pre-raphealite paintings recreated classical Greek, Medieval, and folk fashions with a heavy dose of dreamy fantasy quite unlike the rigid world of corsets and hoopskirts in the 1850s and 1860s. There was plenty of controversy surrounding these sensual models, especially considering that many were mistresses of the painters themselves! These ladies appear unfettered by any social, sexual, or fashion restraints in their pictures: clinging silks drenched in rain hug every curve, a corsetless waist is girdled softly with gold, and hair flies around their shoulders freely. Though the fashions might be too much for the everyday Victorian lady, glowing crimson locks were well within the average woman’s reach. The red-haired beauties filling the canvases inspired women to once again run to their nearest druggist for the reddening power of henna dye. No list of spunky, game-changing redheads would be complete with Ms. Lucy! The saucy sit-com queen is famous for her brilliant red mound of spunky curls. From 1951 to 1960, Lucille Ball entertained the world on her TV shows I Love Lucy and The Lucy-Desi Comedy Hour. Though these are her most famous accomplishments, Lucille’s resume includes much more, including modeling, a brief stint as a Broadway chorus girl, and acting work in films alongside the Three Stooges, Ginger Rogers, and Katherine Hepburn. She’s known for being outspoken and participated in a few small tiffs with social norms, most famously her marriage and divorce to Desi Arnaz. Ball met and eloped with the Cuban bandleader in 1940. 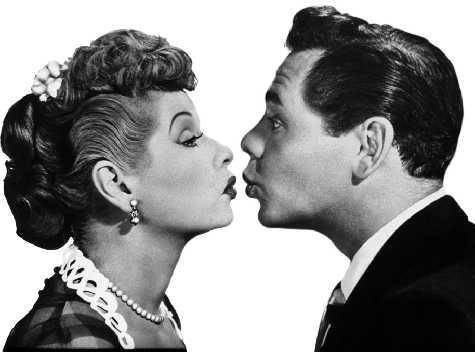 Lucy was 6 years older than Desi, sparking a little social friction since some people thought an older woman marrying a younger man was improper. 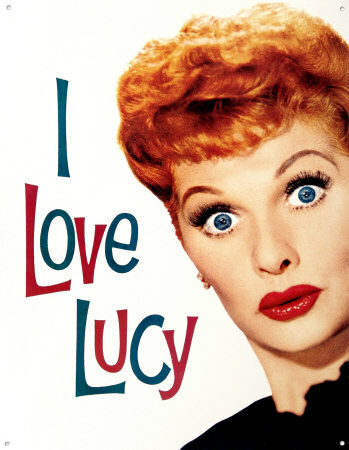 During her first pregnancy, Lucille continued to film I Love Lucy even though she was showing, but the broadcasting company forbade any mention of Lucille’s “condition” on-air. Lucille’s and Desi’s first child, Lucie Désirée Arnaz, was born when Lucille was almost 40 years old! Lucille’s second pregnancy, however, is the one she is most famous for. TV in the 1950s was heavily censored and everything that went on air had to be approved by a committee. This time around, Lucille’s real-life pregnancy was worked into I Love Lucy’s plot. In a magnificent segment, she appears on camera, glowing, to surprise Ricky with the news. It was a huge moment in television history. Here’s a bit of a surprise: Lucille Ball was not a redhead. Lucille Ball was actually a natural brunette/dark blonde, but she dyed her hair using that fabulous plant dye, henna. As her fame grew, so did the demand for red hair dyes, driving the sale of natural henna color through the roof. The queen of mid-century comedy continued to dye her hair throughout her life, maintaining the titian tint that came to define her. 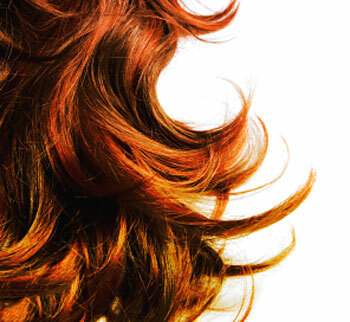 Today, most hair dyes are synthetic and can be done at any hair salon, or at home with a box kit. The coloring agents come in liquids, foams, brushes, and sprays in every color under the sun! With all these magic concoctions so readily available and inexpensive, it’s hard to imagine that such a seemingly innocuous thing like dying your hair for prom or using a color rinse shampoo before a date could have such a huge impact on fashion and society. What if Elizabeth had been raven-haired? What if Pre-Raphealite painters preferred blondes? 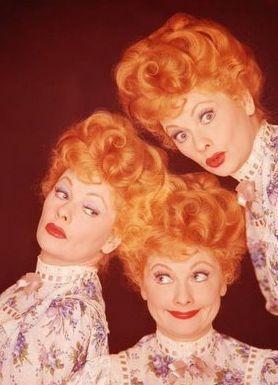 What if Lucille had never dyed her hair that brilliant orange-red? Knowing that so much of who you are as a person can be linked to something as simple as hair color makes me wonder: What’s my “true” color? 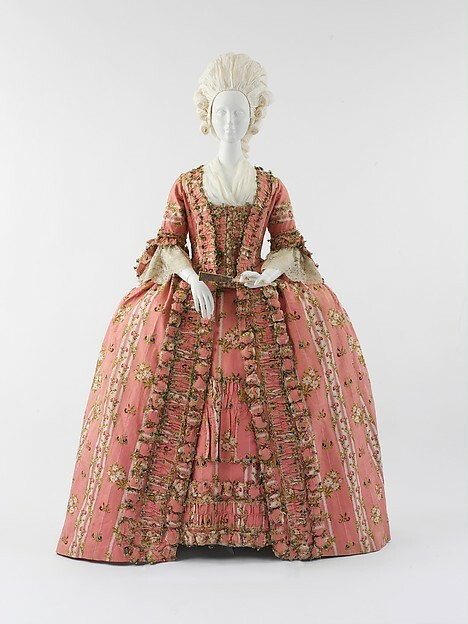 18th Century fashion usually gets pegged as being full of pink, light blue, ruffles, skirts wide enough to get caught in doorways, lots of escaping bosoms, and tall wigs coated with flowers, ships, bows, and lace. All of this is very true, but just like today, fashions changed immensely from 1700-1799, riding multiple trend waves like all those miniature boats on giant wigs. The world was in a great upheaval: kings gave way to parliaments, colonies gave way to nations, frivolity gave way to reason, and then it all reversed again. Every nation gained power, then seemed to lose it. Fashions fluctuated just as wildly as the times, but the haze of forgetfulness and generalization has condensed most of these fluctuations into the brief world of Madame de Pompadour (1721-1764) and Marie Antoinette (1755-1793). But even these ladies didn’t remain stuck in one fashion trend their whole lives. 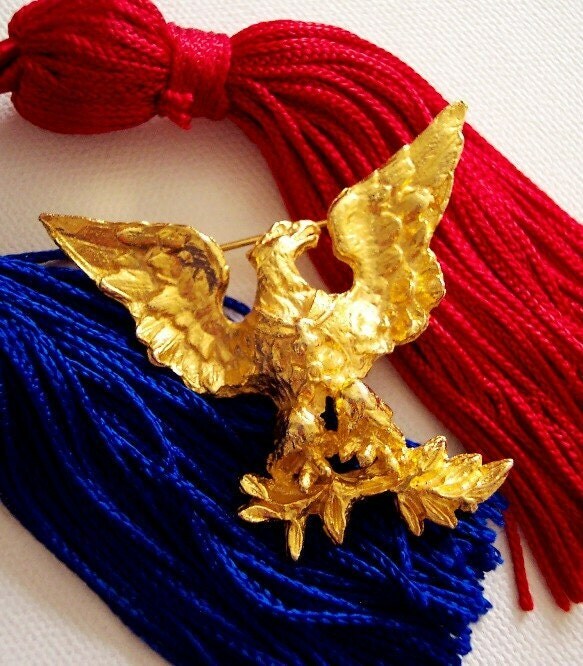 Over the course of their lifetimes, the world and fashion changed drastically. This is truly the lady who took fashions to the extreme. 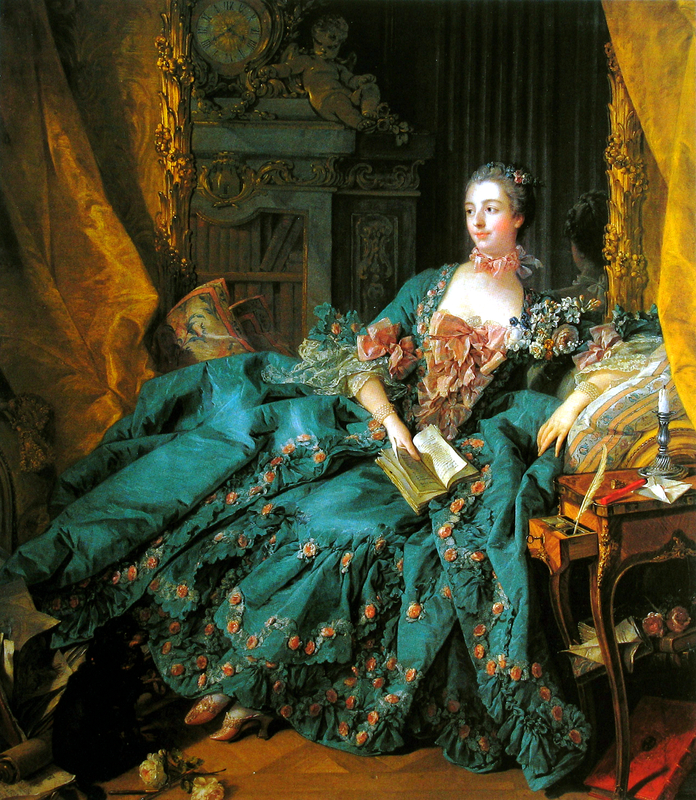 As mistress to the king, Jeanne Antoinette Poisson, aka Madame de Pompadour, indulged in fashion from the start. Born to a relatively unknown family, Jeanne was considered a commoner by the French nobility. 1745, however, she received a Marquise estate as a gift from the king who made her his official mistress. In order to prove her worth, the highly intelligent woman began to craft the most luxurious outfits she could. If a lady had fifteen bows on her gown, Jeanne had twenty. She adored fabric prints, exotic imports from the East, and watercolor-like “ikat” or “chine” weaves. Silk was the only material any proper lady would wear to court. There were even laws banning imported cotton just so French silk weavers would be assured a brisk business. As a patron of the arts, Jeanne adored the Rococo style, commissioning artists and architects to lavishly decorate her palaces for her. Her gowns were just as much artistic and architectural endeavors as her chateaus. Her favored sleeves were made of tiers of lace and ruffles that cascaded from her elbows. They were called “Pagoda sleeves” after the tiered Japanese towers. 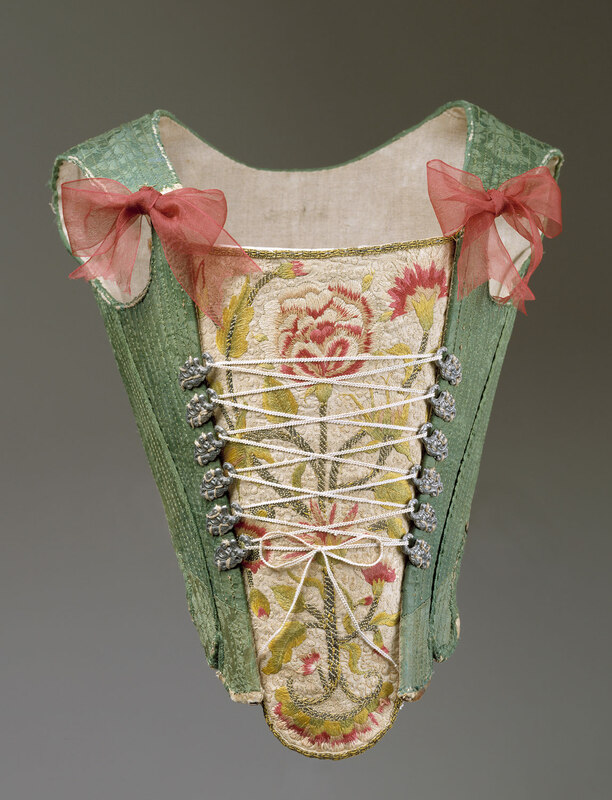 Her gowns were also held out at the hip with large panniers and her tiny, pointed waist was the result of a heavily-boned corset, giving her the silhouette of an upside-down tulip on a stem. She also popularized the turkey or sack back style dress, which had a cape built into the back of the bodice that melded with the skirt, like the back feathers of a bird. 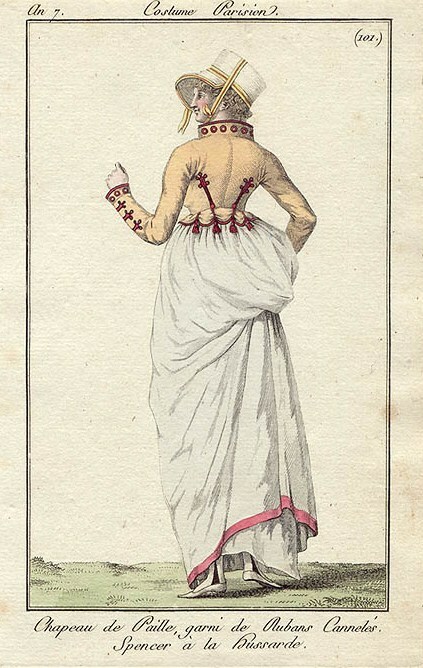 This back is often seen in Robe à la Français (The French Dress), which are what most people picture when they think of a Rococo dress. 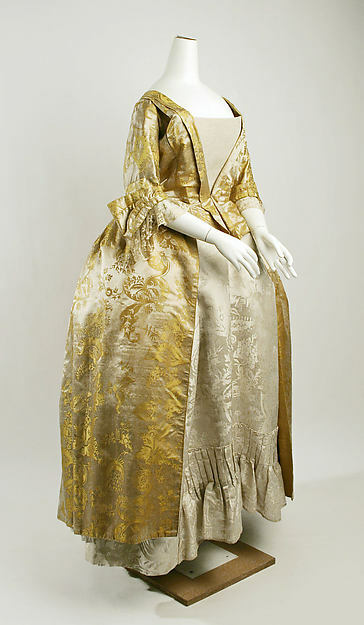 This style of gown is supported with panniers, unlike it’s sister, the Robe à l’Anglaise, and is considered much more sumptuous. 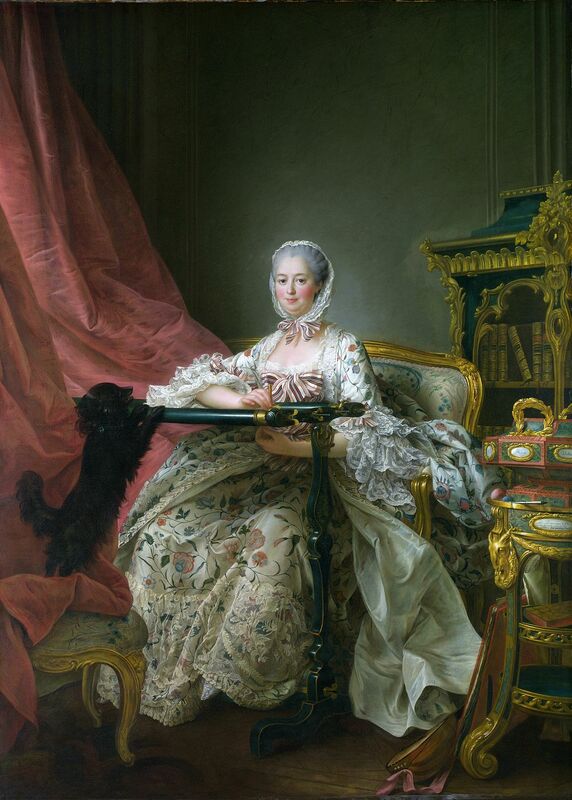 Madame de Pompadour was very aware of her age. She never fully left her luxury behind. She was a Grand Mistress to the end, making sure that even in her last portraits, she had a little wink in her eye. As she became older, her spirit stayed young, but her body began to lose pace. Jeanne adopted dresses with more coverage. Jeanne took to wearing a bonnet tied with a bow to hide her tiny double chin , but still teased the king with glimpses of skin from her low bodice. She was mourned greatly when she died at age forty-two from tuberculosis. 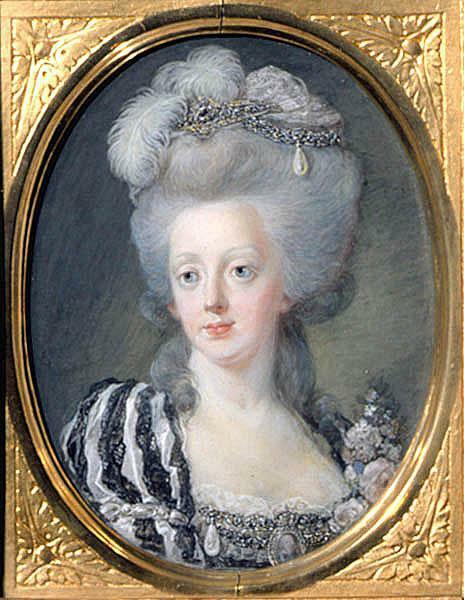 Even during her lifetime, Marie Antoinette went through fashion changes. Her famously gigantic balloon dresses, even 300 years later, are still some of the most talked-about fashion creations ever sewn. Many of her richer gowns were born more out of courtly expectations and loneliness (since her husband paid little attention to her), than pure folly. Clothes and make-up became two of her few socially acceptable forms of self-expression. 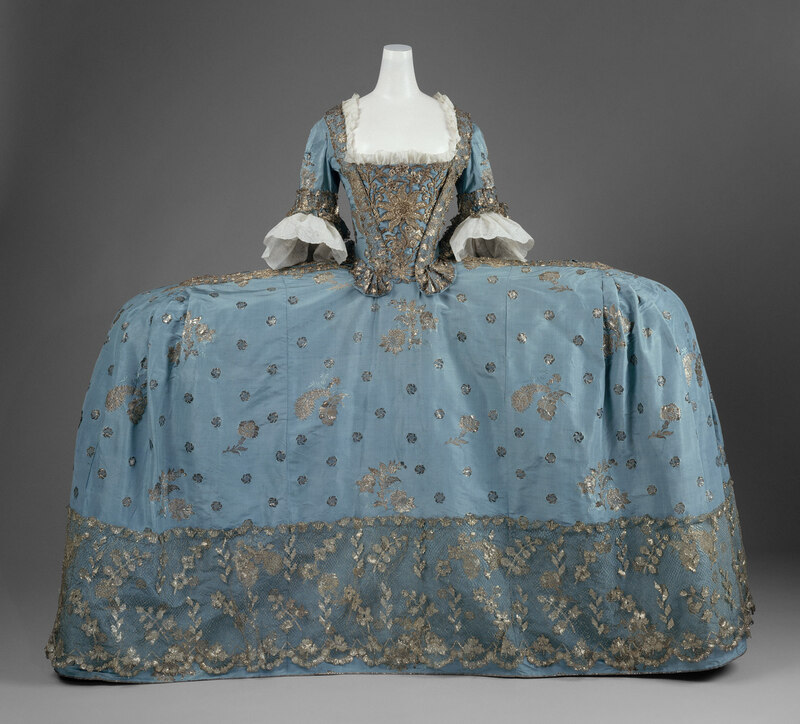 Marie Antoinette loved soft blue; it was the color of choice for many of her portrait gowns. Held out on either side with panniers (fashioned by cane arcs in fabric or by padded “dumplings” of fabric) that sat at the hips, her huge silk skirts were dripping with every form of ornamentation possible. The sleeves and bodice of her gowns fit tightly, exposing her bust and lily shoulders in a sensuous curve. When she wasn’t at a ball, portrait studio, or public function, however, Marie’s dresses, though still rich confections of fine silk and lace, were much less impractical. Her skirts were slimmer and clung to her legs. Though she indulged in wild court costumes much of the time, she took to reading books and hosting salons when she had a moment to herself. After the birth of her children, Marie began to wear deeper, richer colors like browns and reds, and the shoulders of her gown moved closer to her neck with a little lace and long, fitted sleeves. 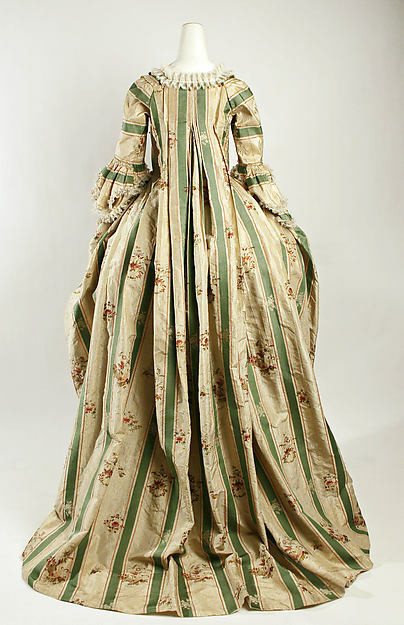 This style of fitted overdress was known as the Robe à l’Anglaise (The English Dress), which had no pannier underneath to support it, relying on petticoats instead. The extravagance of her gowns cost her a lot of public respect. It seemed that she couldn’t please anyone, so Marie abandoned the excess in favor of simpler fashions. She grew tired of the heavy rococo style. She had lost almost all of her influence in court and almost all her relationship with her husband, so she devoted herself to her children. Towards the end of her life, Marie’s huge gowns vanished from all but her more formal portraits, and she created the chemise dress: a plain, filmy gown with layers and poufs of fabric that draped around her. A wide satin belt delineated her waist and added a pop of color to the otherwise light gown. The French people were slightly upset about this, believing it to be unfitting of a Queen, but as the tide turned even more against her, even her simpler dress was criticized as too scandalous, even condescending. Her big hair never truly left her wardrobe. When she was young, her powdery hair fell in straight ringlets around her neck. Later came the infamous pompadour and towering wigs, but unlike her friendly rival for whom the hairstyle is named, Marie’s wigs were more relaxed, even “fuzzy.” She preferred volume with air, rather than solid hair. By the end of her life, she was styling her hair in large upsweeps, much like the ladies of the late 19th century. She adopted many large hats and bonnets, feathered and lacy, and draped transparent scarves around her neck and shoulders. Dark velvets with delicate, contrasting lace and a flowing plain underdress became her favored outfits– foreshadowing the slim, unadorned gowns of the Regency period. By the end of her reign, Marie Antoinette was much more a regal matron than the seductive vixen the angry revolutionaries claimed her to be. She was executed in a plain white slip and bonnet at noon on the 16th of October, 1793. With her died France’s monarchy and the unbelievable lavishness of Rococo. All of the pictures in this article are linked to to sites detailing each section, so feel free to click and explore! 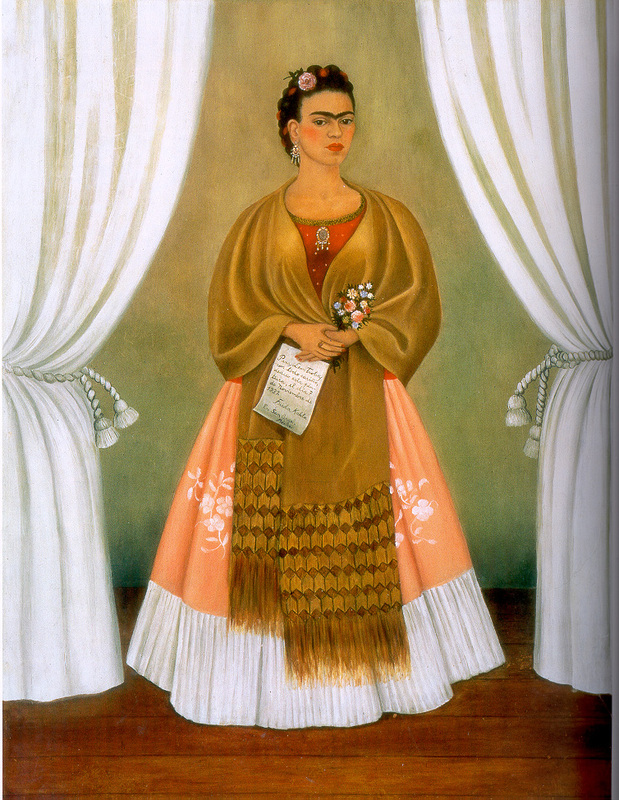 As both a talented artist and a fascinating historical figure, Frida Kahlo has captured the hearts and imagination of countless people far beyond her home country of Mexico. 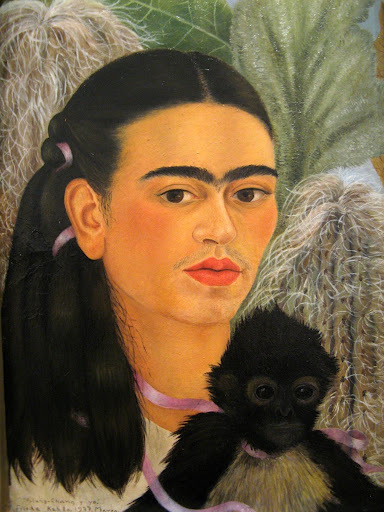 Her myriad of self-portraits feature a fascinating blend of symbolism, color, joy, and pain along with her famous unibrow, mustache, and elaborate costumes. She chose to emphasize these usually shunned features, defying the conventional idea that woman in art should always be soft, perfect, and lovely. Many of her works deal with the conflict between the two sides of her heritage: the proper, corseted Edwardian side, heavily influenced by Anglo culture; and the native Mexican side filled with tropical foliage, flowers, and jungle creatures. Her style is surreal and haunting. Her life is just a wild, strange, and tantalizing as her art. When polio shrived one of her legs at age six, she started to wear long, colorful skirts to hide it, beginning a life-long foray into the highly personal style depicted in her paintings. Later, she would reject feminine dresses and skirts, and often appeared in family portraits in a man’s suit.Her life spans the periods from late Victorian to Mid-Century Retro. 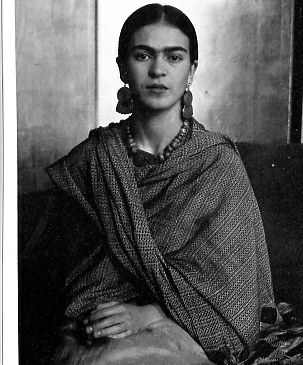 In Mexico, however, these fashion periods are less rigid than they are elsewhere in the United States and Europe, and Frida often took her own liberties with fashion. She was her own person in every sense and rarely allowed current trends to suffocate her personal tastes. 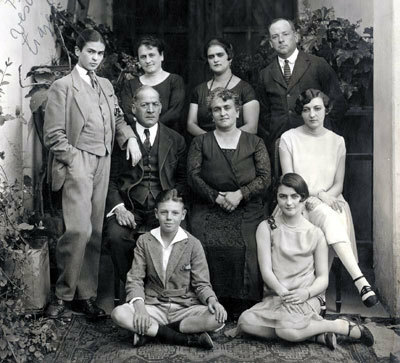 Frieda Kahlo (far left) in one of her suits. When she was a teenager, tragedy struck. As she was riding in a bus when it smashed headlong into a trolley car. The crash left her bedridden in a body cast, and though she recovered, she suffered crippling bouts of pain for the rest of her life. 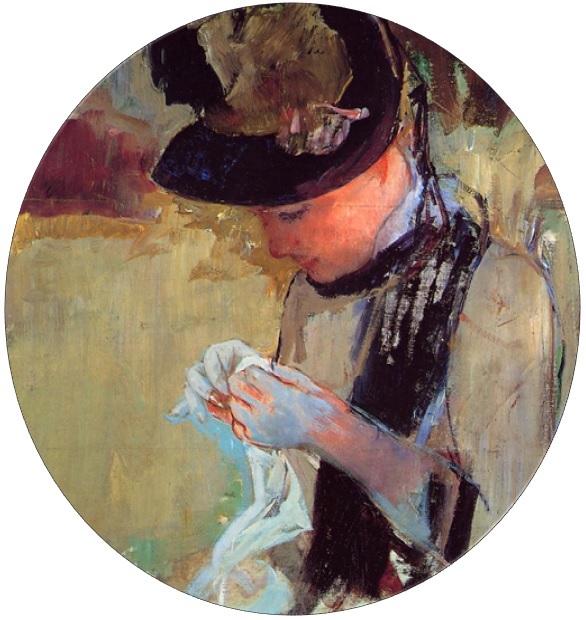 To ease her discomfort, it is said that her father hung a mirror above her bed and it is from that that she begin to paint her poignant self-portraits. The fashions Frieda depicted combine tradition Spanish and Indian costumes from her native Mexico with Edwardian and Deco influences from the United States and Europe. She was highly individual and rarely confined herself to trendy attire. Some of her outfits are surreal constructions of bandages, lacing, and leaves. Many portraits reveal the physical and emotion pain she suffered, exposing ribs , dangling hearts, and gushing veins through cracked chests. The hairstyles in Frida’s work are often the vehicle for her emotions, revealing internal conflicts that rest of painting may not. Her hairstyles vary widely but fall mainly into two popular turn-of-the-century Mexican styles: the slicked back, braided bun and loose, natural hair flowing behind. She often adorned her hair with mounds of flowers, twists of fabric, or just a few ribbons to whisk her bangs back. 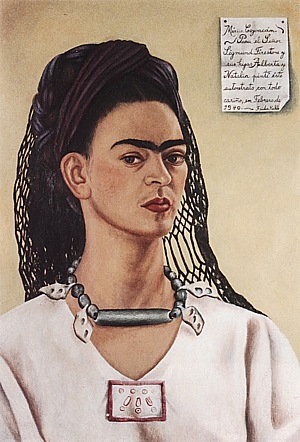 Frida adored large pieces of jewelry, both in real life and in her paintings. She usually shunned popular, delicate fine jewelry, choosing instead bold necklaces crafted by native artists or droplet earrings. Sometimes she wore no jewelry at all, allowing she striking features to be the only adornment she needed.